Safe-T-Pro single use lancets, completely disposable lancet designed with Safe-T-Wing tabs positioned in a T-shape. When the blue trigger button is pressed to obtain a sample, the safe-t-stix spring-loaded firing action breaks the lancet wings to provide a superior fail-safe against reuse. 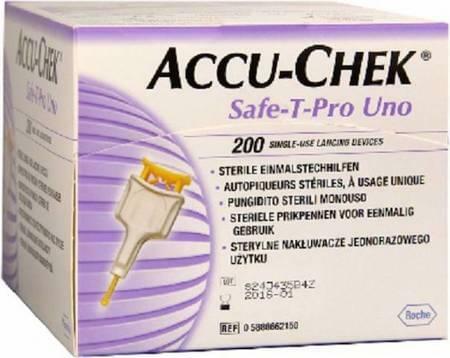 For added protection, the lancet permanently retracts into it's protective case after use to prevent accidental needle sticks and cross-contamination during disposal. 23g X 1.8MMD.